This is the first serious academic look at mainstream unionist politics and the Anglo-Irish Agreement since Arthur Aughey's Under Siege in 1989. Feargal Cochrane describes how the 1985 Hillsborough Pact came as a body-blow to all unionists and loyalists. The book benefits from interviews with all leading players in the campaign against the Hillsborough Pact, most notably Peter Robinson and Sammy Wilson of the DUP and James Molyneaux, the former UUP leader. The author believes that unionism is not a monolith and that the `unionist unity' that came out to oppose the Pact was an illusion. `The unionist campaign against the Anglo-Irish Agreement illustrated that the gradual breakdown of unionist unity... was not simply the product of personality clashes or a structural division between political parties (though these were important) but was a reflection of fundamental socio-economic and cultural differences within the ideology.' As he points out, various persons were pulling in different directions. As unionist councillor Michael McGimpsey put it, there are strong ideological differences right through the Ulster Unionist Party itself, `not just on devolution versus independence versus integration, but also you have socialists and liberals and high Tories, extreme fascists even.' Getting such a disparate group to pull in one direction was quite a problem then. It is no easier today! Cochrane traces the road to the Hillsborough Pact. As he points out, the essential genius of the Hillsborough Pact was that the British and Irish governments knew that they could do business with one-another and they were both attracted by a scheme which did not require the active participation or support of those in Northern Ireland for its survival Unionists were genuinely shocked by the Agreement. Under Molyneaux's leadership they had trusted Margaret Thatcher as a `friend of the Union'. The most poignant to the sense of betrayal felt by the unionist population came from the then Upper Bann MP, Harold McCusker. `The Agreement deals with my most cherished ideals and aspirations... I stood outside Hillsborough, not waving a Union flag - I doubt whether I will ever wave one again - not singing hymns, saying prayers or protesting, but like a dog and asked the government to put in my hands the document that sold my birthright... I felt desolate because as I stood in the cold outside Hillborough Castle everything that I held dear turned to ashes in my mouth.' It is clear that the campaign against the Pact was hamstrung from the start. There was no clear target to campaign against apart from the symbolic Maryfield Secretariat so the bye-elections, boycotts of government ministers, street protests and suspensions of council business had little or no effect. The unionists did demonstrate the essential truth that Ulster has been a colonial dictatorship since 1972, as business went on without them. This was hardly what most of them had intended. Frustration set in as the campaign made no visible headway and unionist solidarity crumbled. 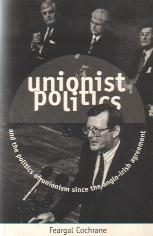 This book makes it clear that some unionists' hearts were not really the campaign to `smash' the Anglo-Irish Agreement. Molyneaux, the UUP leader, saw the existance of a united front against the Pact as an end in itself - as a means of preserving unity and maintaining morale - rather than forcing the British government to abandon the policy. Molyneaux admits, 'that he never regarded the campaign as a means of bringing down the Agreement, but saw it simply as an exercise in letting off steam, which had it not been released, may have been used for more destructive purposes.' (page 193). In effect Molyneaux allowed himself to be used as an establishment safety valve. He prevented Ulsterfolk from taking the only really effective action to undermine the pact - the establishment of an alternative structure of government in Ulster to which unionist-controlled councils could have pledged their allegiance. It's no wonder that a grateful British government made him a Privy Councillor and a Peer of the Realm. In their terms he deserved his reward. Peter Robinson did consider Ulster independence but only as a Sword of Damocles which could be hung over the British government to prevent it from making large-scale concessions to the Irish. He saw independence for Ulster `not [as]an alternative to the Union, but an alternative to any attempts to force unionists into a united Ireland' - in other words, he was just bluffing and the Thatcher government knew it. After examining the failure of the campaign against the Hillsborough Pact and the rebuilding of bridges with the British government up to the ceasefires, Cochrane concludes that `Ulster unionism faces some stark questions as the century draws to a close... At its most basic, unionism is dependent upon the maintenance of the Union. This is a potential problem as it is a relationship which requires two parties. In this sense unionists are not in full control of their own philosophical or political identity.' (page370). This is unionism's greatest weakness as it cannot stand on its own feet. It requires reciprocation of its declarations of loyalty from the British state. Only Ulster-nationalism can enable Ulsterfolk to control our own identity and destiny.